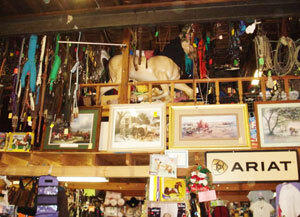 English & Western Tack & Apparel • Large Consignment Department! Serving the Equestrian Community for over 20 years. 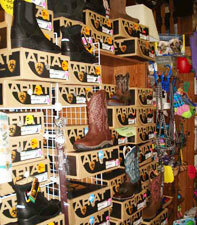 Just arrived� lots of new Styles from Ariat! 50% off all remaining fly accessories. 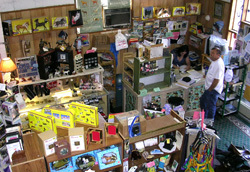 The Horse Barn Tack Shop is conveniently located one half mile north of Falmouth Bridge on U.S. Highway One in historical Falmouth, Virginia. 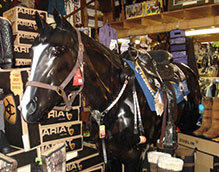 We are your one stop quality shopping place for all your Equestrian, Riding, Stable, Barn, Horse and Gift needs. 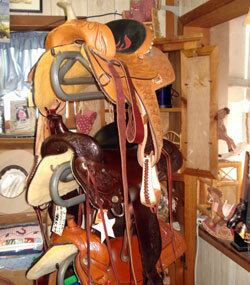 We are a full service Tack Shop and carry everything English and Western, as well as accessories. Call us to find out about our WEEKLY SPECIAL! Everything Horses! 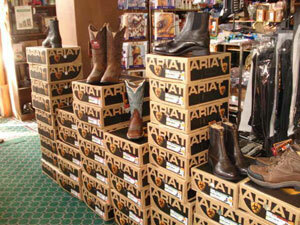 Largest selection of Ariat Boots in the area. Special orders welcome. Check out our low, low prices. Because our Tack Shop carries such a complete line at reasonable prices for all your needs and is easily accessible from Fredericksburg, Spotsylvania County, Stafford County, Caroline County, Fauquier County and even Northern Virginia, it is well worth the drive to find exactly what you are looking for. When you visit The Tack Shop you can be confident that you will receive personal attention, and accurate and knowledgeable guidance about any item you are considering to purchase. You will also find all the tools and supplies you will need to properly outfit a rider of any experience level with the proper apparel and gear. 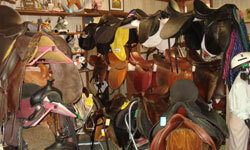 At The Tack Shop you will find just what you need for the outfitting and care of your horse and equipment. 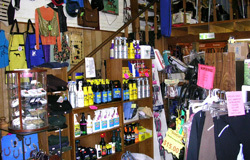 The Horse Barn Tack Shop also serves the Equestrian Community with a Consignment Shop by buying and selling slightly used good condition apparel, saddles, blankets, helmets, boots, gifts, accessories, and other equipment for the beginner or budget minded rider. We are also always accepting your items for consignments. So turn your unused or unwanted stuff into cash. Whether you are looking for one item or to completely outfit yourself and your horse we can probably provide you with everything you are looking for with brand new or slightly used quality apparel, equipment and tack. Crystal Donnelly is an accomplished sketch artist of horses and pets and offers her services to provide you with an original one-of-a-kind hand sketching of your favorite animal, which you can treasure and display for years to come. The Horse Barn now has Golf Carts or Barn Karts or Carry Alls with dump beds available for sale! These are great to have to get around the stable and can be utilized for farm work, horse stables, Equestrian Centers and horse shows. Some rentals available, so call for details!